Completing a degree or training program at criminal justice schools in Rhode Island can prepare a student for a rewarding career in the field of legal and protective services. Larger cities like Newport have the highest crime rates which means there is a greater demand for police officers, law enforcement officials and even lawyers in these areas. This page will provide information about training programs and attractive job opportunities across the state for students interested in pursuing a degree in criminal justice. After Criminal Justice School in Rhode Island: What's Next? Starting the search for a criminal justice school in Rhode Island that offers the right level of training for attractive jobs in the law enforcement or legal field can be difficult. Make use of the ranking tool below to compare schools based on various factors, including tuition, acceptance rate, student-to-teacher ratios and more. 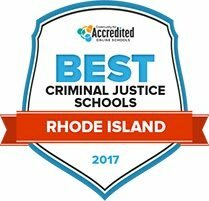 Check out Rhode Island's best criminal justice schools for 2017 below. The Criminal Justice and Legal Studies Department at the Community College of Rhode Island administers associate degrees in two specialties, paralegal studies and law enforcement. All students who declare the law enforcement major must pass a capstone course. The course is worth three credits and requires students to complete criminal justice case studies. Areas taught during the capstone course are in justice administration, crime scene investigations and procedural, constitutional and evidentiary law. As a final degree requirement, the capstone course is the last class taken in the associate degree program. Before finishing paralegal studies, adult learners must complete a student assessment portfolio. Roger Williams University offers multiple degree options for criminal justice majors, including bachelor's master's and juris doctor. The undergraduate curriculum provides a foundation of knowledge centered on critical thinking analysis, and a broad view of the criminal justice system on a national level. Combined degree programs offer accelerated schedules for students seeking to continue on to graduate level: the program provides options to facilitate completion of both a bachelor's and master's degree, or a master's combined with a juris doctor. Many facets of the program are offered in an online learning environment or a combination of on-campus and distance learning. Salve Regina University's administration of justice program provides degree paths for associate's and bachelor's degrees, as well as a minor option. The program offers small class sizes and innovative teaching techniques, in addition to opportunities such as internships and community service roles to balance theory with practical knowledge. Options for accelerated completion allow qualified students to effectively reach their academic goals and continued graduate degrees in shorter periods of time than traditional programs. Additional certifications in areas such as juvenile justice are offered to graduates who hold the bachelor's degree in administration of justice. Undergraduate and graduate level criminal justice degree options are offered through Johnson & Wales University. With campuses in several states, as well as online options for graduate students, the university offers flexible options to prepare for a career in fields such as law enforcement, corrections, criminalistics, and a variety of other security and court administration roles. Completion of the program requires core courses, in addition to curriculum within arts & sciences to ensure each graduate receives a well-balanced knowledge base including a focus on critical thinking skills and efficient communication through writing. With an interdisciplinary focus and a wide range of course options, the criminology and criminal justice path at The University of Rhode Island offers multiple choices for students seeking a bachelor's degree in the field. Internship or independent study credit can often be applied toward degree completion. The university currently offers a bachelor of sociology degree with a focus on criminology, which offers a broad range of knowledge on criminal justice at multiple levels. This degree path combine theory with practical experience and is intended to prepare students for continuing education or a career path within the criminal justice landscape. Undergraduate students can pursue a bachelor's degree or a minor in justice studies through Rhode Island College. Included within the sociology department, the degree requires courses from multiple disciplines and is expected to be competed on the traditional 4-year undergraduate timeline. On-campus resources such as the OASIS office provide guidance and academic advising for students and coordinates orientation events for new and transfer students. Additional resources include tutoring services and writing assistance, as well as outreach programs and the Career Development Center which assist with internship placements, job search resources, and major and career decisions. Providing students with online and hybrid criminal justice degree options, New England Institute of Technology has flexible options to prepare for a career path into the criminal justice field. With accelerated courses to suit busy lifestyles, the accelerated time frame includes 10-week courses and can be completed in an online format, or a mix of hybrid courses to incorporate face-to-face and distance learning. Program resources includes a simulated courtroom for practical exercises, in addition to a crime scene simulation lab to apply knowledge. Graduates have accepted roles in multiple public safety capacities with local law enforcement and government agencies. Many criminal justice jobs across the state require training at a dedicated training facility after completing a certification or degree program. Those interested in serving as a police officer, detective, magistrate, court reporter or private investigator will need to complete their education at an accredited criminal justice school in Rhode Island. Use the tool below to compare top schools based on factors such as majors available, degree programs and tuition rates. The Providence Police Department, Rhode Island District Court and the state government office of the State of Rhode Island Department of Corrections are some employment opportunities to explore when starting or growing a career in the criminal justice field. Those looking to work as a police officer, legal assistant, criminal investigator or court clerk may need either a degree or to complete a formal training program for certification. Use the tool below to compare careers and educational requirements. Providence, Rhode Island, and all the major cities across the state have an ongoing demand for police department jobs, which account for just small selection of the government jobs available in the field of criminal justice. Most law firms are in Providence, Cranston, Warwick and Pawtucket, so graduates may consider relocating to these areas when pursuing a career as a legal assistant or lawyer. The table below outlines different career options available in Rhode Island compared to the national average. The ACC offers educational programs and resources that cover topics of interest for in-house counsel for businesses and organizations. This U.S. Small Business Administration page links to all of the Chambers of Commerce that can be found in the state of Rhode Island. The State of Rhode Island Department of Business Regulation maintains a comprehensive listing of regulations for different types of businesses, licensing information, and enforcement actions. The Rhode Island Department of State has a Business Services division that includes information about legislative updates, forms, databases and resources. This organization promotes the development of minority business owners and maintains a directory of resources, forms, applications and minutes from board meetings. The SBA has offices throughout the country to help small businesses with their development. The RIDOC is a unified correctional system and the website lists all facilities for both males and females. The site includes details about probation and parole, rehabilitation services and the latest news updates. Located in Central Falls, RI, this detention facility recruits correctional officers on an ongoing basis. The website includes information about recruitment efforts and details about the Correctional Officer Training Academy. This website serves as a resource for those who work in correctional facilities across the state. Includes information about upcoming events, political issues and the leadership team. This page supplies information about the juvenile correctional services program in Rhode Island. The National Center for State Courts provides a wealth of resources for the community and legal professionals in every state. The Rhode Island section includes information about judicial officers, human resources, and courthouse facilities. This group was established as a statewide program to provide advocacy to children in Rhode Island who are referred to family court as a result of the filing of an abuse, neglect or dependency petition. This page provides information about the justice reinvestment effort that is currently underway in Rhode Island. This is the official government website for the Department of Justice and includes information about state and local courts, laws and regulations, and legal ethics. Also lists employment opportunities. This is a comprehensive website for attorneys and legal professionals. Includes details about court calendars, court holidays and employment opportunities. These is also a dedicated section of public resources. This non-profit association supports mediators in Rhode Island for the purpose of promoting and advancing peaceful dispute resolution. This website features policies, legal resources and updates about legal affairs for residents and legal professionals in Rhode Island. It includes information about the Office and an annual report. Lawyers interested in offering pro bono services can find information about volunteering on this site. This site also includes information about the courts and assistance programs. This website serves as a resource for Bar members and the general public. There is a members-only section that includes an online law library, information for attorneys, and other contact information. RIPA is a non-profit association that works to connect and recognize members of the paralegal profession. This organization offers membership opportunities and resources for police chiefs across the state. The website includes information about upcoming news and events, awards, and membership details for those interested in joining its mission. This organization is a membership-based group where private investigators can network and share information and resources. The Division of State Fire Marshal is tasked with conducting fire investigations in cases involving injury/death, an undetermined cause, and/or suspected arson. This division also inspects structures to ensure compliance with fire safety and state law. The Rhode Island Municipal Police Training Academy (RIMPTA) trains and certifies all municipal police officers outside of those serving in the City of Providence. This website includes recruiting information, in-service training opportunities and web-based training programs. The City of Providence, Rhode Island’s police department reports the last news, information about internship programs, and policies and procedures. Police officers and those interested in a law enforcement career will find a wealth of information about Providence legal matters on this site. This group represents the Rhode Island State Police’s non-commissioned officers and troopers, providing them with networking opportunities and resources. This is a non-profit organization that serves as a facilitator for those involved with the conservation of the state’s natural resources. The site includes information about current activities and education resources. This webpage outlines the process of becoming an officer who enforces laws, rules, and regulations related to fish, game, wildlife, and other environment-related resources. One of the major functions of the Forest Environment Program is to manage law enforcement efforts related to forestry. This organization lists upcoming events, projects, and area plan developments. Its mission is to maximize natural resources across the state and it works closely with elected civic leaders and volunteers.